The latest piece of Long Branch’s ongoing renewal, a two-block long project in the geographic, social, and cultural heart of the city, is bringing Long Branch’s historically vibrant arts scene back to life. 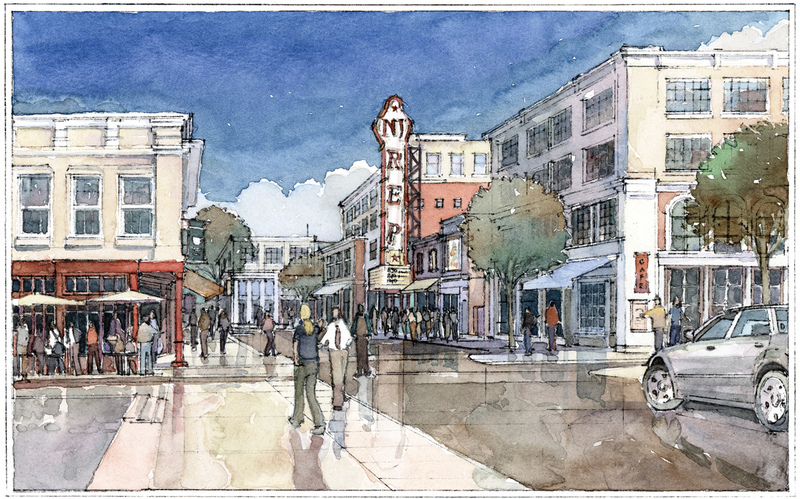 The plan, Broadway Center, is part of the City of Long Branch’s Redevelopment Master Plan, the goal of which is, in part, to revitalize the city’s main street which had been historically the arts, entertainment, and commercial strip of the city. Broadway is a wide avenue that begins just west of the beach and continues for approximately one mile to the NJ Transit train station; it is expected that this revitalized cultural center, which will include housing, two performing arts centers, retail shops, and restaurants, will help link the current redevelopment of the city’s beachfront to the rest of the city. With the development of large suburban malls in the area, Long Branch’s retail core became blighted in recent years. As businesses fled the city, the lack of economic stability led to the deterioration or abandonment of the housing stock, and, with the exception of a small repertory company, the disappearance of the arts and entertainment life that Long Branch was once known for. Many of the buildings in the Broadway Center block are boarded up with few owner-occupants. Not surprisingly, the block attracts few shoppers; most residents avoid the Broadway corridor, believing it to be unsafe. To reverse this trend, Broadway Center will focus heavily on the inclusion of community spaces, arts and cultural facilities, small and large retail spaces, and other entertainment options in a range of building types. The artistic centerpiece of the two-block development will be the renovated Paramount Theater, which is currently being used as a storage warehouse for a paint company. It will be restored as an 1,800-seat theater, and negotiations are underway with a California theater company that mounts seasonal productions to take up residence at the Paramount. The New Jersey Repertory Company will also be in residence just down the street. The inclusion of loft-style spaces to provide space for visual and performance artists is also in keeping with the project’s theme. The development team worked with city officials to come up with plans for the right mix of retail shops geared to the city’s entire population, including retail to serve the 7,000 full-time students attending nearby Monmouth University, which is within walking distance of the project. The developer is also working with existing retail rental tenants in the zone to help them improve their business skills. The Incubator Retail Business Program, offered to retail tenants in the two-block redevelopment zone, is designed to allow experts retained by Broadway Arts Center to work with the retailers on a development retail plan to better serve the customer base of their businesses. Housing is the other large piece of the puzzle. Long Branch’s downtown currently offers few housing choices to accommodate the city’s wide range of needs and incomes. While cheap apartment housing is available, it is often found in blighted areas and in deteriorating buildings. And while luxurious beachfront housing is going up, much of it is only for seasonal residents; affordable modern year-round housing is almost non-existent in the downtown. The 500 new residential units planned for the Broadway Arts Center Plan provide a variety of housing types – townhouses, apartment houses, and live/work studios – as well as a variety of ownership types, ranging from 100 for-rent student housing units for Monmouth University students, 100 affordable rental units, 56 moderate-income units, and 296 market rate condominiums. The size and scale of the project are specifically designed to facilitate personal interaction and walkability. All streets in the site area are being reconstructed to provide wide sidewalks to encourage pedestrian activity, outdoor seating, and gathering spaces at arts venues. A number of small outdoor plazas are being provided to accommodate social gatherings. Each street is faced with buildings, so that interactions on the street are safe and in view of habitable spaces. The inclusion of a diversity of types of buildings in the plan will help ensure social interaction, and the two theaters, art galleries, and club spaces will generate activities that enhance the vibrancy of downtown Long Branch for residents and visitors alike.